One of the joys of static caravan and lodge ownership is the ability to get away from it all, relax and enjoy some of your favourite pastimes. Only problem is, storage can be at a premium and the last thing you’ll want is a cramped or cluttered caravan. 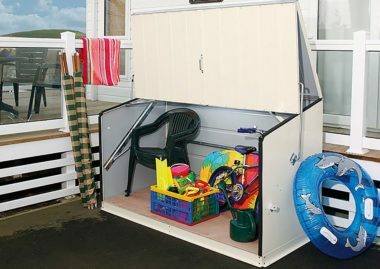 So in this gear guide, we take a look at some outdoor storage solutions so you don’t get that hemmed in feeling in your static caravan and you can keep your outdoor stuff where it belongs – outdoors! You’ll want outdoor storage which is robust enough to be left for long periods of time, particularly when you’re not staying at your static caravan in the winter months. There are a range of compact outdoor storage solutions available to suit most people’s budgets and needs – most of all you want to make sure your possessions are kept secure and protected from the elements. Also, make sure you check your holiday park’s rules and regulations before you buy an outdoor storage unit. Some might not allow large sheds or storage boxes or they might specify a limit to their size or location. For example they might allow outdoor storage boxes on a caravan deck or underneath your unit, but not anywhere else around your caravan. Consider metal storage over plastic and wood. Many parks won’t allow wooden sheds due to their fire risk, plus if your static caravan or lodge is sited near to the coast then you’re going to want something that will withstand salt erosion and high winds – galvanised metal should do the trick. Metal storage units will also offer better security and are less prone to break-ins. You’ll also want to invest in a good quality lock to deter thieves and make it difficult for any potential caravan thief, particularly if storing expensive items like bikes or electrical items. Consider where you’re going to put your outdoor storage unit and keep it sheltered so it’s less likely to be damaged by high winds. Look for a robust unit, which is big enough for your needs. You might be looking to store all manner of items, such as garden/patio furniture, bikes, barbecue, lawnmower, fishing gear, tools and gardening and cleaning equipment. Don’t go for anything too heavy in case you do need to re-locate. 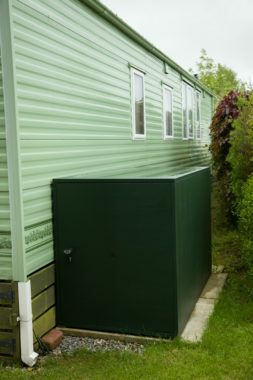 Outdoor storage units are covered by our holiday caravan insurance as they are part of the structure of your static caravan or lodge. The contents and personal possessions you keep inside them are also covered as long as you keep the storage unit locked. Just remember to include the value of the storage box and items kept inside within your sums insured. Each year at Leisuredays, we deal with claims for storm damage to sheds and outdoor storage units, so it’s important to make sure you anchor them down and make sure any lids and doors are securely fastened. Break-ins can also happen so as mentioned above we recommend you invest in a good quality, strong lock to protect your belongings. Sheds and storage boxes are great for storing some of your personals possessions locked away, such as barbecues and garden furniture. Damage to items left out in the open when your lodge or static caravan is not occupied will not be covered. This is great for static caravan and lodge owners who need plenty of storage for their outdoor equipment. 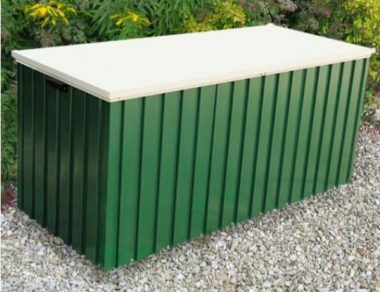 It comes in two colour choices to match your holiday caravan – green or cream – and its PVC-coated galvanised steel construction means it’s fire resistant, and that it comes with a 25 year no rust perforation panel guarantee. It’s spring opening action gives you quick, walk-in access to your belongings. 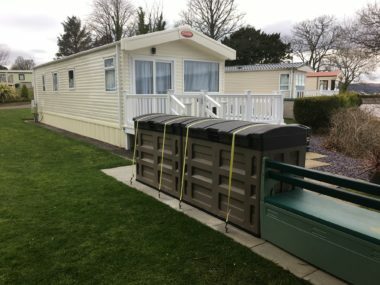 If you simply don’t have the space for an outdoor storage box or your park doesn’t allow an external unit then you might want to take a look at an undervan box. This can cleverly sit underneath your static caravan or be attached to the chassis and are almost out of sight. This box is set on runners so it can slide out to give you access to your bits and bobs. And it’s pretty tough too, made from a durable Galvatite steel and a weatherproof finish. Features also include: Hinged lid, 10-year anti-perforation rust warranty and choice of three colours – dark green, dark brown and ivory. If you’re looking for something a bit taller for items like step ladders then a shed might be a better option. 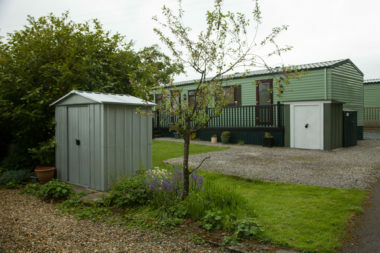 The Trojan Caravan Site Shed is a tall metal shed with weatherproof, galvanised steel panels and a built-in metal floor with a large, easy access door. There’s even an wind/rain guard to help keep your belongings dry and safe in the wet and windy months. It comes with a 10 year anti perforation warranty and has a three-point locking system. It needs to be fixed to a level, firm surface, such as concrete, tarmac or patio. Features also include: Ventilation system and pre-drilled to accept shelving and hook packs. Available in three colours – dark green, brown and ivory. A patio box is great for sitting on your patio or decking to store things like chair cushions, toys, muddy boots. Plus with it’s flat top it can double up as seating. 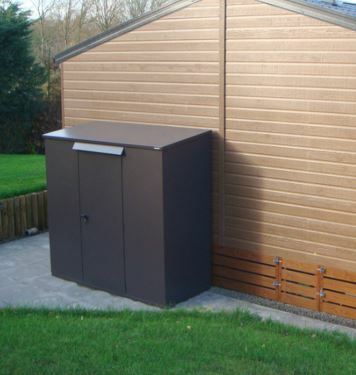 This metal storage is clad in hot dipped galvanised steel so it should be very durable and maintenance-free – as well as protecting your gear from the elements and those pesky rodents! It green colour should fit in with your surroundings. Got any advice or experience of outdoor storage at your static caravan or lodge that you’d like to pass on to fellow caravanners. Please feel free to add a comment below. 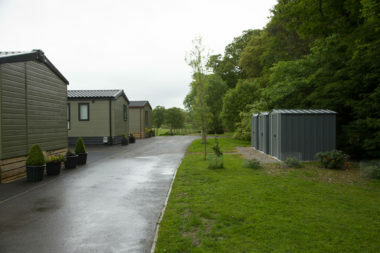 Holiday caravan parks are blooming! Would like quotes for cream coloured metal storage boxes. If you follow the links in the article you will find the costs. I had a tailormade box for lawnmowers etc, fitted under my static. To my horror, one very wet winter, it was the perfect “stepping stone” for a rat to access the van via a floor ventilator. Buyer beware!